Any kid who had tons of dolls and toys growing up knows that most of those toys had a short shelf life. Barbies eventually broke, action figures melted in the sun, and building block pieces got lost in the little nooks and crannies of your house. But there were always those one or two toys that were precious exceptions. You treated them more delicately than anything else in the world. While your other toys were lucky to last six months, these toys lasted years. In fact, you probably still have a couple of them lying around in an old box somewhere. You might not have even thought about your childhood toy stash in ages, but this adorable pup might just convince you to drag them out for one a play session! According to her hooman, so far this precocious pooch has torn up every stuffed animal she’s ever had … except this one. Why this one is so important to her is anyone’s guess! Maybe the reason why she’s so protective over it is because it sort of resembles her? Maybe she thinks the toy is her little brother? It wouldn’t be the first time a dog or a human had an imaginary friend! 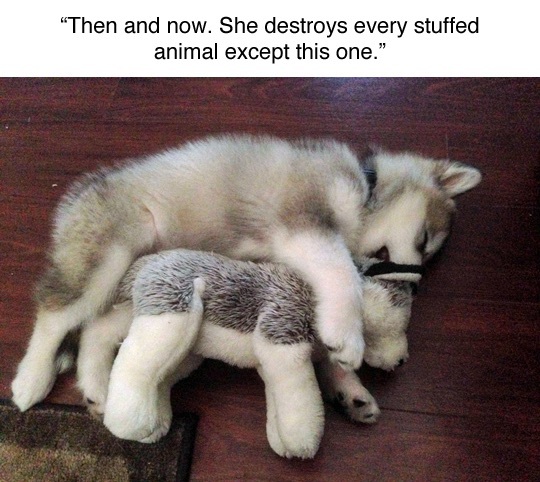 A few years later, she’s large and independent … but no matter how much time passes she just can’t let go of that old stuffed toy! Being an adult is all well and good, but it never hurts to reopen childhood memories and rediscover some of the things you used love. Based on this pup’s story the same can be said for beloved animal friends! 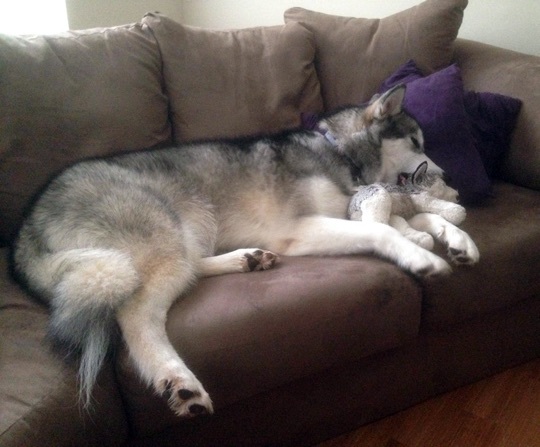 For more awesome videos of cute doggies ( and other animals) loving on stuffed toys, click here.